Well we made it through with very few scrapes. So barring the sinus infection things went well. We went to my parents house, which is only about 85 miles away, on Sunday and stayed until Friday. The boys are always pretty relaxed at Grandma and Grandpa’s house. We have lived close to them for about 6 months and it has been great. My Mom’s mom was also there too and since she has spent time with us a month at a time the boys have a good relationship with her too. 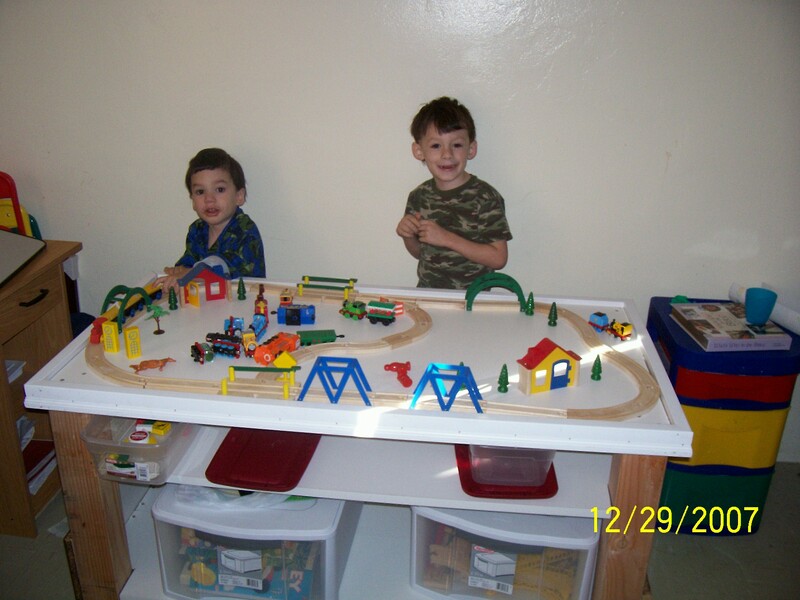 So Christmas morning the boys finally wake up and come down to see this huge train table that my dad built for them the day before. It was so cool. My mom had bought a small train/track set to keep at her house, we already have one for our house, hence the need for a table. so they set it up completely and the boys went to playing. Then it was time for the unwrapping of presents. This was one of the parts I have been dreading for the past 3 Christmases J has hated unwrapping presents. It has taken like all week for him to get them all open, or we have to open them for him. there was even one year when we forgot to take a present out of the closet and we ended up saving it for his birthday in March. But this year was totally different. He had been waiting to get at the presents from the time we got there on Sunday. We even broke our Christmas Eve tradition and let them open a few more than ONE gift. So Christmas morning he was ready to pounce on the presents. Little J took time between unwrapping to play with the train table. Of course it helped that almost everything he got was a train. 🙂 So the only thing J had a hard time with was NOT opening the presents that were being saved for the evening when the cousins arrived. After presents the boys helped Grandpa make the chocolate doughnuts that are a family tradition and a recipe passed down from my great grandma. It was totally adorable. J was the helper and Little J got to observe. 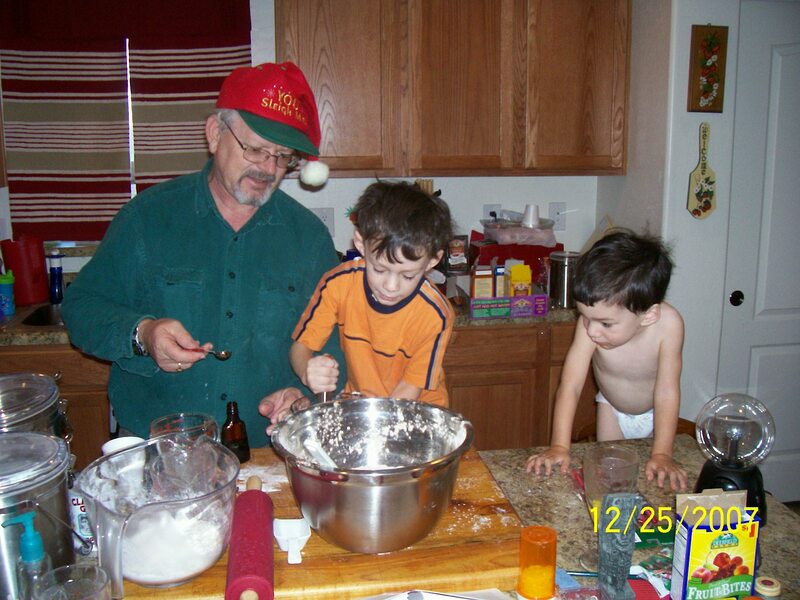 He was told he could help next year, but somehow he ended up with just as much flour on himself as Grandpa and J. We got some great video footage and a couple pictures. My mom printed one off for my dad and he was so proud that he taped it to the lid of the cookie jar containing the ones we didn’t eat for breakfast so that they could all see who made the doughnuts. We even managed to fit a nap in that afternoon so the boys would be refreshed when every one else arrived. By 5pm we had grown to 9 adults and 5 kids total. J had very few scuffles with the cousins, but hey what 4 year old doesn’t? We kept a movie runing most of the night so that helped him to regulate. He did have a hard time when it was a cousin’s turn to pick, but other than that it went well. In fact he napped most of the week. It helped that my mom rewarded him with cupcakes if he slept. Yeah my kids will do anything for food. On Wednesday DH and I left before J woke up to go to the urgent care in Tucson. they gave me antibiotics and I spent the rest of the day resting on my own couch. 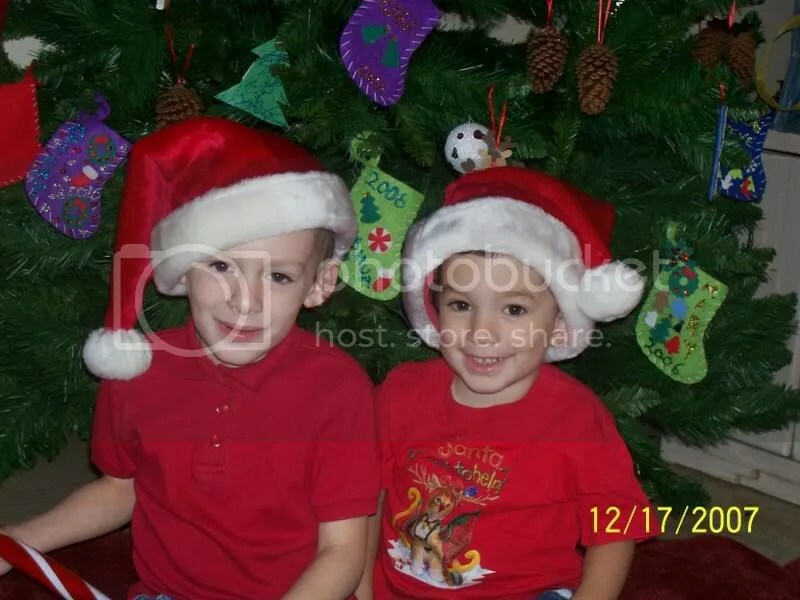 the boys did awesome staying with my parents all day. I think we are almost ready to work our way up to the weekend stay-over…really did I just type that? they barely even noticed when we came back. Usually if I am not there when J wakes up he freaks out at bed time and keeps asking if I am going to stay all night. There was none of that. Thursday was another successful day. The boys stayed home with daddy and grandpa while us girls went to hit the sales. Then we came back and put them down for naps. Mom and Dad, DH, and I all went to the movies. we had a lot of fun and when we got back the kids were raving about having a great time with Grammie. what a relief! Friday was a little tough. We had to get everything packed and loaded into the car. Then we drove up to my cousin’s house in Phoenix and had a repeat of family members from Christmas. Only this time my Uncle cooked everyone a venison dinner. YUM! The boys had a little bit of a rough time. There was lots of fighting over toys and crying. Little J didn’t want to eat anything. It wasn’t until 3 hours later when we were getting ready to leave that he conceded to eating toast. We were on the verge of leaving after only being there for about 90 minutes when we popped in a movie and everyone settled down. I often feel guilty for the amount of TV he watches. but then I think about how unhappy he is when it isn’t on. Its not that he actually watches so much, just uses it as a sound track for playing. I can’t really blame him. I have the TV on a lot too but not watching it. He probably got used to the sounds of it in utero when I would stay up late due to heartburn and uncomfortable belly. We’ve tried TV fasts, everyone ends up grumpy. So I try to make up for it by making sure we get out of the house and away from it. That usually works when no one is sick. I can’t wait for school to start again. He hasn’t asked about it, but I can tell by his behavior that he is missing that part of his routine. We’ve dealt with a lot of delayed echolalia over the years but this past week there has been a lot of immediate repeating. We say something and he picks out a word or two that he likes the sound of and just chants it back at us. A bit annoying when Little J joins in too. So that’s it. Pretty much a success when all things are considered. I have to give credit to great family members who are super understanding, his teachers in school who have brought out a great side of him, and a good balance in his meds. Eating good and Sleeping good are key components too. Here is the train table once we got home. I promise that tomorrow I will sit and do our Christmas re-cap. I am on the mend, but only if I take lots of drugs to keep the congestion at bay. But I will leave you with a story from today. J has been doing great lately going with the flow and we’ve seen very few meltdowns. Most of them are short lived and mild compared to a few months ago. So tonight he decided to get his plasma ball (you know the lightening looking balls that when you touch them the current follows your finger?) that he received for Christmas out of the box and styrofoam packing. It had been repacked to make it home from the grandparent’s house. I didn’t realize he was doing this, or I would have stopped him and done it myself. His dad who could see him didn’t think to stop him!!! So he got it out of the box and when he opened the styrofoam it crashed to the ground and shattered. Crying ensued. He came running to me in uncontrollable tears and was sad and angry all at the same time. I had to send him to his room for his safety while I cleaned up the glass. He was still crying. Once I got it swept into a pile I went to comfort him. (yeah where was his dad? He felt that looking up a new ball on ebay was more important. He is still having trouble connecting with J when things aren’t going along swimmingly) So when the glass was clear and we said he could come out he started pummeling the couch and then sat in the middle of the floor and just cried and screamed. I managed to get him up and to the hallway so that we could “Stomp our grumpies out” but this mostly entails me stomping and him watching, but he lightens up and usually ends up laughing. Not tonight. So we went in his room and he decided the best way to get ungrumpy was to start a pillow fight. Shortly after Little J joined in and as they chased me out of the room I coulda sworn there was giggling. Later after dinner I was looking up new plasma balls on ebay and he sat next to me to look too. I didn’t mention that I was going to buy one, I was just looking. He kept staring at them and asking “which one is my lightening ball?” Turns out his dad had already purchased one. So the crisis is over and happiness will be back tomorrow. I apologize for ignoring you all this week. After my dental work I got a full blown sinus infection. Still battling that. AND horror of all horrors I’ve had to share a computer with 2 other people this week, and since it doesnt belong to me, I don’t get dibs. To top it all off Not all the keys work well so typing is slow and painful. My new shiny notebook arives tomorrow and I will be happy. Thanks for all your well wishes. I hope I feel better soon too. 🙂 Hard to enjoy being with family when it feels like your sinus is trying to jump out of your face or through your ear. Blech. I’ve been out of commision since Friday morning on pain killers for a tooth extraction. Normally when I am sick I still have to be mom too. The kiddos have no idea what mommy being sick is like. Even if their dad is home, they still want mom to do EVERYTHING for them. For once things were different. They have had their usual squabbles, but mostly when I am awake. When I was knocked out they would play quietly or lay with me. It was not near as bad as I was expecting. I am going to share with you the follow up repost from yesterday “What we won’t be doing for Christmas.” But before I get to that I gotta tell you about today. I had to get a tooth pulled today due to it falling apart and shooting pain clear up to my eyeball. When it came time to put Little J down for nap he wanted me to sing him his favorite song (part of our nap time routine.) But I could barely talk let alone sing. I got J out of the living room and asked him to sing “Moon Moon Moon” by Laurie Berkner. I was expecting him to say “no” because he was eating but he came in and sweetly belt out the notes and Little J went to sleep peacefully even though he had a stand in performer. Well last night I was bummed, but I realized today that my kids don’t need to be introduced to Santa in person to enjoy him. J has been watching Dr. Seuss’s The Grinch Who Stole Christmas (a.k.a. The Sneaky Grinch ~ J and The Spooky Witch ~ Little J) a LOT ever since I DVR’d it a week ago. Last night we bought the Christmas Classics DVD set that included The Grinch so now he can watch it with our commercials. Tonight we watched Twas The Night Before Christmas and Rudolph on DVR and he loved those as well. Night Before Christmas is on the set we bought 🙂 So I can share my love of all things Christmas with him through a media he loves MOVIES. UPDATED to add: We’ve also been turning on the kids music channel on satellite and have been dancing to holiday favorites every couple of days. I was reading some past blogs of other moms with autistic children and they referred to their past experiences as a very autistic Thanksgiving and a very autistic Christmas. It got me thinking what all that entails. You see I love the holidays. I love to decorate, hang lights, put up my numerous holiday bears including the Dated Snowflake/Keepsake Teddies from WalMart and the kiss kiss bears from CVS, bake pumpkin bread, blast Christmas carols, watch Christmas movies (ad nauseum), think about snow, get holiday family portraits, have big family gatherings, etc etc. I LOVE it ALL. But J doesn’t. All of that departs from the normal routine and it sends him spinning out of control. Oh he may give the appearance of enjoying something like all the Christmas lights but then we must go for crazy walks to see them all. And he enjoys the cartoon Grinch Who Stole Christmas, but to the exclusion of all else. Pumpkin bread is great for him but it moves his bowels a little fast. Pretty much everything else causes major crisis meltdowns. He will probably spend a good portion of Christmas day either isolated in his room at my parents house (by choice), in time out for lashing out against his cousins, or crying. That I can’t really avoid except to help him regulate himself (in the presence of 14+ people). We are going to have to talk about it A LOT. Luckily I know he will be getting some of his most wished for items from Santa/Grandma and these might keep his attention for a good portion of the day. But here are some other things we won’t be doing that ideally I’d love to do. We also will not be going to the breakfast with Santa provided FREE by the base. It is hard enough to eat at a Table with the two munchkins, even harder out of the house, throw in a room full of noisy children and you are mixing a recipe for disaster. And what would be the point? Although we “believe in Santa” it is a vague concept in this house. To try and introduce the kids, who would inevitably have to wait in an insufferable line, to a stranger in a big suit in beard would definitely be asking for the grumpies at best and uncontrollable crying at worst. We are still going to try for a cute Christmas Family photo, but if J is wearing his lion t-shirt and worn out sandals, it is not my fault. (As long as no one is crying, we consider it a good picture) I tried to get him to wear closed toe shoes tonight for seeing the snow, it was an all out battle. Then we went to buy him new sneakers and he wouldn’t try any on. AND THEN I tried to talk him into a pseudo sandal that had a closed toe and he insisted that his are just fine. Well I guess if my motto is “I’m wearing sandals as long as there is no snow on the ground.” then he can wear sandals all year long in AZ (I just wish he’d wear some new ones that aren’t falling apart) If I ever get him to wear a new shoe I am going to buy 2 of every size for the next 4 sizes. then he can be obsessed with them for as long as he wants. P.S. he’s been obsessed with the same pair of underwear for over a month now, and buying extras didn’t help because one pair is already worn out. I can count on one hand the number of times he has worn a different pair of underwear (and never the look alikes) always with a fight. But he’d rather wear nothing or a pull-up than to have to change. Lots of hand washings and wasting of electricity in the dryer. Seriously! ADDED December 20th, Santa came to class today at J’s school and they said it did not go well. He stayed as far away as he could get and was withdrawn for the rest of class. I guess I made the right call. The kids are taking turns who throws up at 3 am now. Last night it was Little J. J seemed fine for the past 48 hours so we assumed school wouldn’t be a problem. 30 minutes into class and 15 minutes into my date with DH we got a call saying he had diarrhea all over himself and the floor. By the time we got to the school he was cleaned up and sitting in the circle for songs and story. They let him stay and finish the alphabet phonics song. I’m glad we did, I’ve caught snippets of it for the past 2 weeks but now I have a frame of reference. I really want to get a sitter for Little J after the new year and go in for a whole class to see exactly what they do. I love seeing J in his element and it is easier to talk to him about his day, work on communication, and memory if I know what I’m asking about. He’s been fine the rest of the day, but neither of them ate much dinner and that is usually a sign of more sickness to come. I am off to bed to get a head start on sleep, hopefully I will not have to leave the bed till a reasonable time and there will be no extra laundry for me. Here’s hoping! I had no idea that the dinosaur pajamas from a couple nights ago would totally replace the cowboy shirt. I thought maybe we could alternate them so that I could do a little less laundry. I was wrong. I found this out because J threw up again last night, all over the new PJs and I didn’t wash them. He wanted to wear them tonight and it was the end of the world when I wouldn’t let him. I even offered up the cowboy shirt and was shot down. That was a little underestimating. The Forgetful part is that I did put his blankets that he NEEDS for sleeping in the wash but forgot to put them in the dryer until after we got home from shopping at 9:30pm. So when I offered up other solutions he batted them out of my hand and kept inching towards the laundry area (for the PJs and the blankets.) I told him I would bring him his stuff when it was dry. He finally decided to take one of my old quilts, I billed it as one of mommy’s favorite blankets from when she was little. Then I went to check the laundry and lo and behold his stuff was dry, extreemly hot, but dry. So I rushed them in to him. The mood he was in he would have waited up until they were ready. Tonight was one of those nights where I was very grateful for DVR. I recorded the Survivor finale and reunion. I am a huge reality show freak, all except amazing race and most of the dating ones (I used to, but I’ve ‘outgrown’ them). So I was watching my show and the boys were in their playroom playing and listening to Blue’s Clues in the background. All of a sudden they came out and started singing “if you’re happy and you know it” with the tune from the “curious buddies” trailer at the begining of their DVD. It was totally adorable but I didn’t pause Survivor because it is usually short lived. J used to sing for me all the time. It was non stop singing and showboating and then it stopped (around the time of our first move this last year). I’d request a song and he’d pout. When we lived in MS for 6 months the only time I heard him sing was when Little J would cry at the dinner table and J would sing Little J’s favorite songs “Jesus Loves Me.” Not because he was compassionate but because he couldn’t stand the noise of Little J’s outburst. So back to tonight. Part of the song was “nod your head” and the two of them were nodding like rock stars but in perfect unison. So after they had sung it twice, I put Survivor on pause to give them all my attention. It didn’t matter to J too much, he wanted to perform for himself, his reflection in the aquarium. I realized it had been a long time since I’d gotten a floor show from the two of them so I grabbed my camera to use the video function and got it turned on. J kept singing and Little J came and stuck his head up in the lense. I managed to get about five 30-40 second videos of the two of them tonight. Different songs, and one of J bossing/cajoling Little J to sing. ADORABLE. My memory filled up after 1-2 filmings so we’d download, watch it together, and then start over again. There is an entire 30 seconds of him singing the words “I Like Bugs.” He learned it on one of the few occasions he’s seen “Yo Gabba Gabba” Quite possibly the most annoying show ever, but that is another post. He’s actually been annoying us with this song when we were out and about this past week, singing it at the top of his lungs in the grocery store. That wasn’t cute, but tonight it was. J was loving being a star and I was enjoying seeing him be him again and a little emotional too. When I realized how long it had been since he had sung for me, I realized how far he’s regressed in a year and how much progress he’s made in a month. Kind of a P.S. to last night. J wore his new PJs all night. this morning Little J asked to wear a dinosaur shirt. Turns out after I went looking for his TREX shirt he was talking about the pajama shirt meant for J. So I let him have it. Rolled the sleeves up 3 times. I think it will fall apart before he outgrows it. (size 6/7) for a 2 year old. And as of now….I am queasy….Thanks J and the virus world.